Can you have too much of a good thing? No way, at least not if you’re talking about halibut ceviche. We ate it straight up at first, as an appetizer with romaine spears and fresh tortilla chips… and there was some left. I packaged up a bit to share with a neighboring boat… and there was still some left. Hmmm, maybe I had been a little carried away with the chopping and dicing, but no problem. The next day I served that chilled, citrusy ceviche for lunch, spooned on top of coleslaw inside a crispy corn tortilla shell. 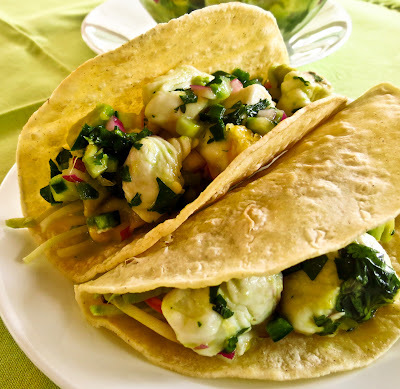 Ceviche tacos were a new-to-us menu item, and they weren’t just good, oh no, they were really really good! Ceviche is already a hit prepared with this summer's fresh halibut, and I can imagine ceviche will be a popular choice at future Make-Your-Own-Taco Parties. Cut the halibut into ½-inch cubes and set aside. Use a glass container and combine the marinade ingredients. Add the fish cubes and toss gently to coat. Press down ever so gently: you need enough liquid to cover the fish completely, so keep the same ratio if you find you have to add a bit more. Cover and refrigerate until the fish is opaque, “cooked” by the acidic juice marinade, roughly 2-4 hours. When fish is completely opaque, drain off the liquid, reserving 2+ tablespoons of the juices. Mix the diced poblano, onion, orange pieces and juice, cilantro and cucumber together in a large bowl. Add the fish chunks and gently stir to mix (a rubber spoon-type spatula is useful here). Add salt and pepper as desired. Cover and refrigerate until ready to serve. Just before serving, use that spoon-style spatula to stir in the avocado and a tablespoon or two of the reserved juices. Lightly coat a small non-stick skillet with a fine mist of cooking oil spray and heat over medium heat. Cook a corn tortilla, turning frequently, until warmed through and brown spots appear but not so long that it crisps. Gently form the warm tortilla into a folded shell and let cool draped over the edge of a straight-sided container until it firms. Repeat with remaining tortillas as desired. 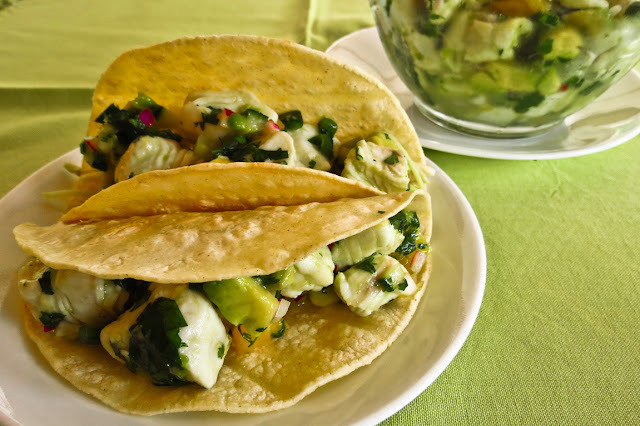 Place a bit of shredded cabbage inside a taco shell: use a slotted spoon to scoop up ceviche to fill the taco: squeeze a lime wedge or drizzle of bit of tequila on top and enjoy! I've been aware of this technique for ages, but wrote it off as too fussy and more than a little intimidating. Why mess with wrapping with paper? won't the fish get mushy? and on and on the excuses went as I talked myself out of any attempt to cook en papillote. Bad move, cuz this technique rocks! Note to self: be more adventurous more often! Most of my prep time went into selecting ingredients, skimming some recipes for ideas and mentally tasting the different flavor combinations. Choices, too many choices, and I wanted to try them all. I settled on two contrasting combinations. Mediterranean: fennel, kalamata olives, tiny tomatoes, garlic, capers and a pinch of lemon zest. Asian/fusion: lemon, ginger, sesame, scallions, sesame oil, mirin and sweet Thai chili sauce. Following that I sped on to skin the steelhead fillets and chop a few vegetables - sped on? well, that took mere minutes. Next I cut four parchment rectangles and was ready to roll, fold and tuck. Cookbook recommendations for oven temperature ranged from 350 to 450 F, too wide a range for comfort, and cooking times ranged accordingly. Playing it safe, I settled on an already-proven 15 minutes per inch of thickness at 425 F. It worked beautifully with our 1-inch thick steelhead fillets, though I did open one packet to check for doneness after 12 minutes. RL practically swooned after his first taste of the Mediterranean packet, consuming it all before he even tried the other preparation. I opened both of my packets at the same time, savoring the aromas, tasting a bite from one then a bite from the other, back and forth. My favorite was the blend of Asian ingredients; the sauce alone was tasty enough to eat with a spoon, maybe toss in some rice to soak up the last drop. I'll make both of these variations again and again... the Capt. would love fish en papillote weekly. Layer ingredients in order listed on 10x12-inch piece of parchment paper. Repeat with other fillets. Refrigerate until ready to bake. Place baking sheet on middle oven rack and bake approximately 15 minutes, depending upon thickness of the fish. At this temperature my oven takes 12-15 minutes per inch of thickness. Open one parcel a few minutes early to check for doneness; the fish should flake easily. Serve parcels immediately, still wrapped so each diner can enjoy the fragrant, steamy flavors as they open their individual serving. Open one parcel to check for doneness; the fish should flake easily. After eating countless versions of our longtime favorite Cruising Cookies (link and link), we were ready for a change, something totally different. The Capt requested his favorite Spritz cookies, but they sounded like too much bother without my stand mixer at hand to cream the butter and mix up a stiff batter. I know, don’t say it, “How lazy can I get?” Well, this time laziness paid off with an almost effortless cookielike recipe found in Melanie Barnard’s cookbook, Short and Sweet. · Stir in some citrus zest, dried fruit and powdered sugar. · Mix in the flour. · Press into a square pan and bake for 20 minutes or so at 350 degrees F. until golden and firm. · Cut, cool and enjoy. That’s it, the entire process, and how easy is that?! It takes under an hour and the hardest part is deciding which fruits to use. So far Costco’s cranberries paired with orange zest remain the preferred flavor combination, but dried blueberries and pine nuts with lemon zest run a close second, especially when topped with a thin slather of lemon curd. Can you double the recipe for a big batch? I’ve not tried but it sounds reasonable. Just store the extras, tightly covered, for several days if you don’t eat them immediately. The recipe stated they could be frozen for up to 1 month – and that makes me wonder what happens on days 31, 32 and later. Remove from the heat and stir in the orange peel, cranberries and powdered sugar. Mix well. Stir in the flour and mix until incorporated. The dough will be stiff. Use a spatula to spread the dough into an ungreased 8-inch square baking pan; pat it down firmly. Don’t remove the squares yet, they will crumble and fall apart. Let them cool in the pan for at least 10 minutes, then use a narrow spatula to remove them carefully. Store, tightly covered, for several days. Freeze for up to 1 month.